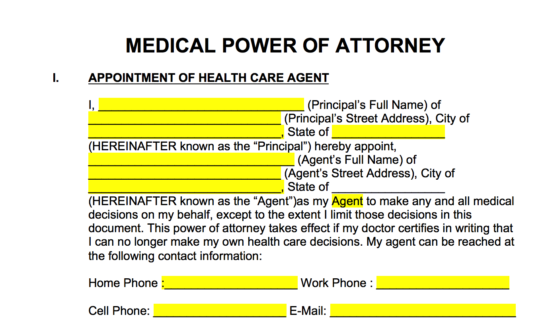 Medical power of attorney forms, also known as an ‘Advance Directive‘ or ‘Health Care Proxy‘, is a form that allows a person to elect someone else to handle health care decisions on their behalf only if they are not able to do so themselves. The situation that would require this could be due to any type of incapacitation events such as a coma, vegetative state, or any type of mental condition that impairs the principal from thinking rational. The document must be signed in accordance with their respective State laws which usually requires either witness(es) or a notary public to view the signatures of the parties. This form is only for health care decisions. 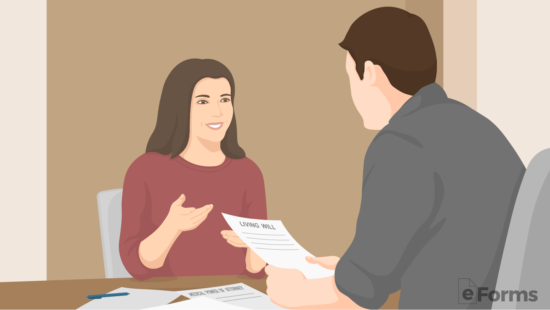 If you are looking to cover financial responsibility as well then you will need to complete the Durable Power of Attorney Form. Living Will – Usually attached to a medical power of attorney, this form allows an individual to set their end of life wishes (i.e. withholding food and water if there is no path to recovery). Download in Adobe PDF (.pdf), Microsoft Word (.docx), or Open Document Text (.odt). Successor (2nd) Agent – Individual selected only if the primary agent is not able to fulfill their duties. Co-agent authority is not usually allowed, must be the decision of 1 person. Compensation – You have the option to set up compensation for the agent selected for lodging, food, and travel costs. 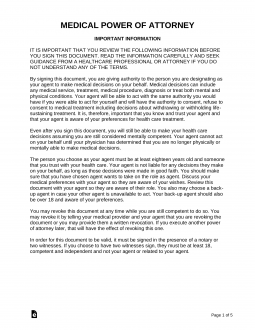 The decisions you give your agent related to your health care is up to you. 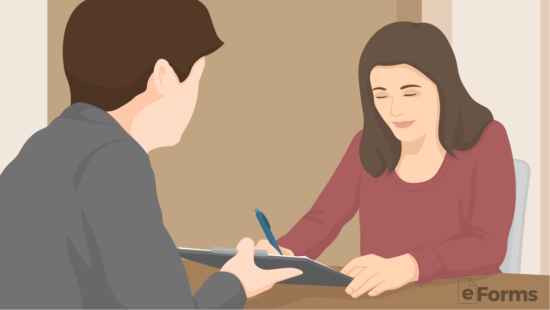 You can allow your agent to make any type of decision that presents itself or you could limit your agent to only certain types of decision making. The more detailed you are as to what your agent can and cannot do will enhance the medical staff on your health intentions. Example – Requesting the agent to refuse life support if there is little to no chance of a full recovery. This is optional although recommended as a living will outlines your end-of-life treatment requests. You can choose to have the medical staff caring for you abide strictly to what you write in the living will or to primarily use the agent in the medical power of attorney. The purpose of this form is to point a hospital and the agent in the direction of the medical care you desire. The Principal and Agent must sign in accordance with their respective State Signing Laws. In most cases, the form may be signed in the presence of two (2) witnesses or a notary public, and sometimes both. After this has been legally authorized the document becomes valid to be used. The Principal must be thinking freely during the creation of this form. The Agent should carry an original copy of their form and will most likely need to present it during every occurrence. It is recommended to give a copy of this form to your primary care physician. 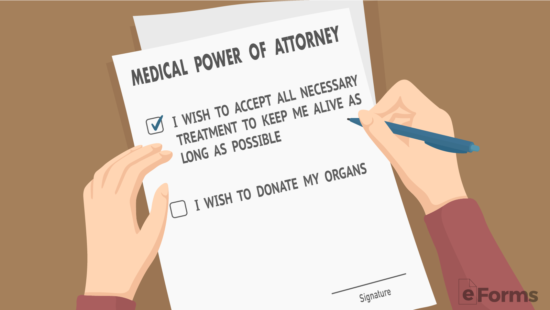 We all hope that we will never need to use a Medical Power of Attorney. But the fact remains we all grow old and life can be unpredictable. It’s not uncommon for a person to fall into health trouble, incapacitation for example, without a medical power of attorney as the majority of people who do have this form are the elderly. A Medical Power of Attorney comes into play when a person becomes incapacitated due to any sort of tragic events such as a car accident or a heart attack. Of course, your doctor or nurse will need to deem whether or not you are coherent enough to make decisions on your own before handing those powers over to your agent to make. If you are found to lack the capacity to make your own decisions, the doctor or nurse will need to state the reasons why. When a person becomes incapacitated without possessing a Medical Power of Attorney, they or their family are unable to create a medical power of attorney while that person is in an incapacitated state. Panic can ensue if the ill person needs immediate help. The only other option is to seek guardianship through the incapacitated individual’s local circuit court which can take valuable time and money as an attorney is most likely needed. A Medical (Health Care) Power of Attorney allows an individual to give someone else the right to make decisions about their end of life treatment options while guiding their intentions in the form. A Living Will lets a person’s end of life plans in a concrete manner without the use of a surrogate to help guide medical staff as to their wishes. The instructions written are to be followed by the patient’s primary care physician and cannot be changed by friends or family. 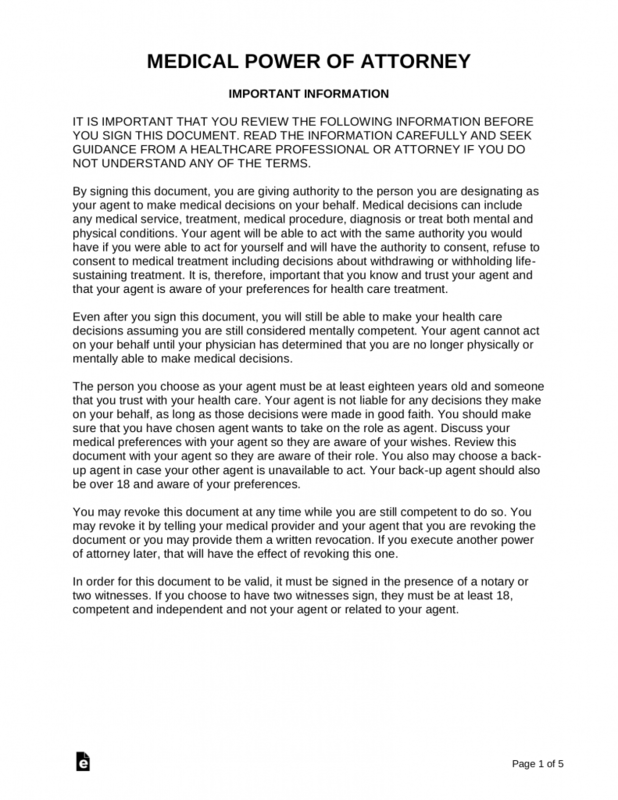 Step 1 – In Section I (Appointment of Health Care Agent) the Principal and Agent full name and address. At the bottom of the section, the home phone, work phone, cell phone, and e-mail of the agent should be written. Step 2 – In Section II the principal should include any exceptions (if any) from the broad powers the agent will have. 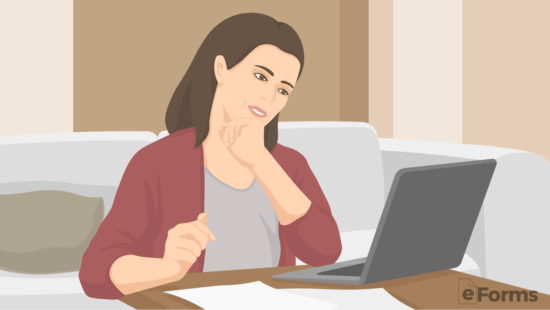 Step 3 – In Section III, the principal has the option of selecting up to two (2) alternate agents in the chance individuals are unavailable for an act for the principal. Step 4 – In Section IV list the locations where originals and copies of this document will be held. Step 5 – In Section V, if the power of attorney will have an end period check the box and initial with the date that the form expires. 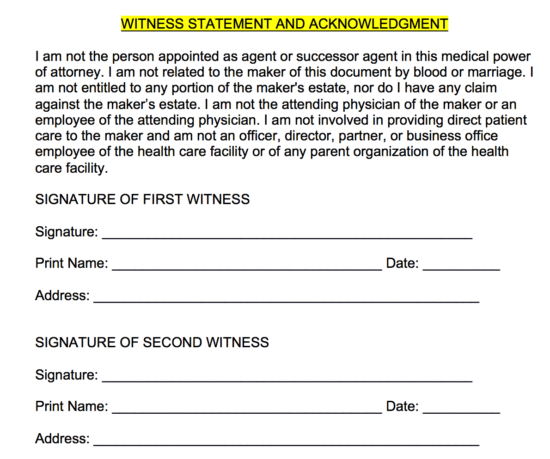 Step 6 – On the last two (2) pages the individuals listed should sign the form in the presence of a notary public and/or two (2) witnesses that are not in any way connected (blood/marriage) with the parties authorizing the form. All parties of the document must be present with the Notary Public. If the State requires two (2) witnesses then the Witness Acknowledgment must be signed on the last page. 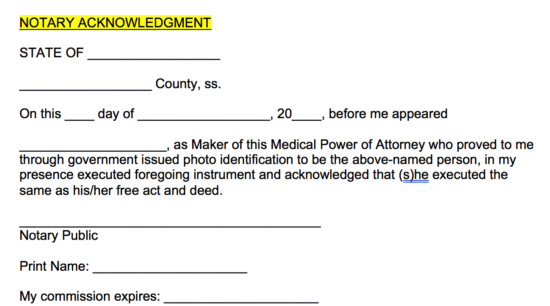 All medical power of attorney forms must be signed in the presence of either witness(es) and/or a notary public. The following States require these specific rules in order for the Principal’s signature to be recognized. AL – Two (2) Witnesses. AK – Two (2) Witnesses or Notary Public. AZ – One (1) Witness not related by blood or Notary Public. AR – Two (2) Witnesses. CA – Two (2) Witnesses. CO – Two (2) Witnesses. CT – Two (2) Witnesses and a Notary Public. DE – Two (2) Witnesses. FL – Two (2) Witnesses. GA – Two (2) Witnesses. HI – Two (2) Witnesses or a Notary Public. ID – Two (2) Witnesses and at least One (1) of the Witnesses signing in front of a Notary Public. IL – One (1) Witness that cannot be related by blood or marriage. IN – Two (2) Witnesses and at least One (1) must be a disinterested party. IA – Two (2) Witnesses or a Notary Public. KS – Two (2) Witnesses not related by blood or marriage or a Notary Public. KY – Two (2) Witnesses or a Notary Public. LA – Two (2) Witnesses not related to the Principal by blood or marriage. ME – Two (2) Witnesses. MD – Two (2) Witnesses. MA – Two (2) Witnesses. MI – Two (2) Witnesses. MN – Two (2) Witnesses or a Notary Public. MS – Two (2) Witnesses not related by blood/marriage or a Notary Public. MO – Two (2) Witnesses and a Notary Public. NE – Two (2) Witnesses or a Notary Public. NV – Two (2) Witnesses or a Notary Public. NH – Two (2) Witnesses or a Notary Public. NJ – Two (2) Witnesses. NM – Two (2) Witnesses. NY – Two (2) Witnesses. NC – Two (2) Witnesses and a Notary Public. ND – Two (2) Witnesses or a Notary Public. OH – Two (2) Witnesses or Notary Public. OK – Two (2) Witnesses. OR – Two (2) Witnesses (One (1) of the Witnesses may not be related by blood or marriage). PA – Two (2) Witnesses. RI – Two (2) Witnesses or a Notary Public. SC – Two (2) Witnesses not related to the Principal by blood or marriage. SD – Two (2) Witnesses or a Notary Public. TN – Two (2) Witnesses or a Notary Public. TX – Two (2) Witnesses or a Notary Public. UT – One (1) Witness that cannot be related to the Principal via blood or marriage. VT – Two (2) Witnesses. VA – Two (2) Witnesses. WV – Two (2) Witnesses and a Notary Public. WI – Two (2) Witnesses not related by blood or marriage.